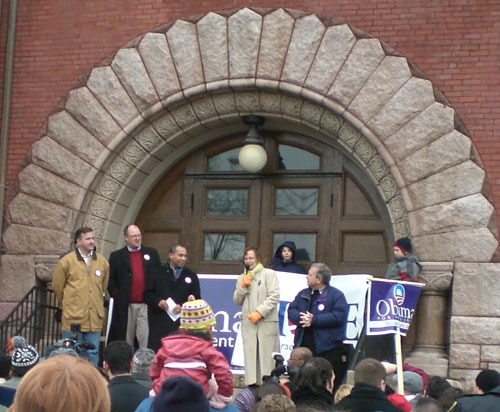 Went to the Barack Obama rally in front of Town Hall this morning. Governor Deval Patrick was there to pump up the crowd and motivate folks to work in support of Obama for Tuesday’s primary. It was quite the political event, and not just in the Presidential and Gubernatorial spheres. I saw my fellow Select Board candidates there – Diana Stein, Irv Rhodes and Aaron Hayden. I also saw the Town Manager and all the current Select Board members, with the exception of Hwei-Ling Greeney – who is both current and a candidate – and who no doubt was busy doing her good work at Not Bread Alone. This was my first time seeing Governor Patrick “live.” I was impressed by how long he spent chatting and shaking hands with people in the crowd afterwards. He probably has a lot of places he needs to stump for Obama today, but he sure didn’t rush away when he was done speaking. And have I mentioned our indefatigable State Rep Ellen Story? She’s everywhere. In the past couple of weeks, I have seen her at a Chamber Breakfast, the Habitat house dedication, the Martin Luther King Jr. Breakfast, the four-towns Regional Schools meeting, and now this. State Senator Stan Rosenberg attends lots of events also (I saw him at the Town’s 250th Anniversary Celebration fundraiser, as well as at the Habitat dedication) but Ellen is ubiquitous. And she has a real gift for remembering people’s names.